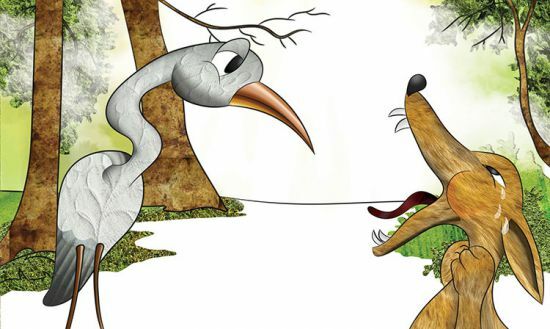 This is The Wolf And The Crane Story for kids. Deep in the forest, there lived a selfish wolf. One day, a hungry wolf was eating his prey. He was eating so rapidly that a bone got stuck in his throat. He ran around the forest howling in pain. “Please, help me! I will reward handsomely if anyone would remove the bone from my throat,” cried the wolf. The wolf was very cunning and never helped anyone in the past. When all the animals heard his cries, none of them came near to help him. A passing crane took pity on the wolf. Even though the task was dangerous, the lure of the profit-motivated him to help. So, the crane decided to help him. Also, read Fox And Crane Story. “I will help you but you need to stay still. I will look down your throat and then remove the bone,” explained the crane. The wolf opened his mouth wide. Soon, the crane peered into his mouth. He soon saw the bone lodged inside. The only way to get the bone out of the wolf’s throat was to put his beak into his throat. She put her beak in and tried to reach the bone but it was lodged well and truly deep in his throat. The crane then put her whole head into the wolf’s mouth. He finally managed to get a grip on the bone and pull it out of his throat. As promised, the crane did his job. The wolf was very relieved that he had been saved. “Now, give me my reward!” the crane demanded. “What reward? You greedy fellow! You had your head in my throat and instead of eating you up, I let you go unharmed. That should be reward enough for you! Go away or I will crush you!” the selfish wolf said. You may also like to read, The Fox And The Wolf. The crane walked away disappointed. Soon, he fled into the forest glad that he had come out of the situation alive. Ath the same time, he felt happy that he helped in saving someone’s life. MORAL OF THE STORY: GREED DID NOT GO WELL WITH GRATITUDE.